www.okeechobeejust4bass.com was working for Capt Mike Shellen today. I was fishing with Chris Halay, his son Mike and Jillian Markwith. It was a 4 hour trip with shiners with over 20 fish caught. 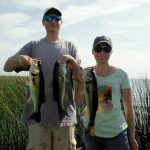 Here is a picture of Mike and Jillian with some of their fish.